Happy holidays! My name is Danielle. I write both Young Adult and New Adult novels under the name D.R. Graham. 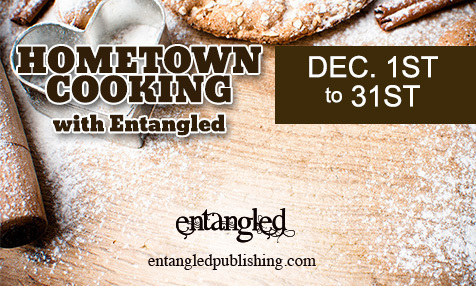 My first book with Entangled Publishing will release this January and the second will release in April. I write romantic contemporary and historical stories that include everything from bikers and cowboys, to search and rescue heroes and World War II fighter pilots. I strive to create book boyfriends for everyone. To be honest, my husband is more of the cook in the family. I prefer to bake, so my Hometown Cooking recipe contribution is a gingerbread carousel that is a tradition in our family. It’s ambitious, so put your apron on. 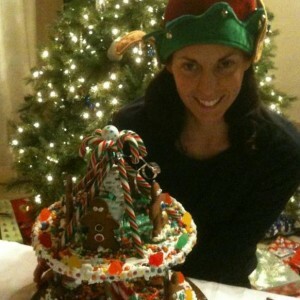 You can’t see the reindeer on the candy cane poles that well in this picture, but they look like horses on a carousel. It’s been a tradition in our family for so long, we mostly wing the design, but I’ll give you the basics. Be creative; that’s what makes it fun! Cut five gingerbread men for the top tier and eight reindeer for the bottom tier of the carousel. Also, shape three 12 inch circles to form the tiers. Once the cookies have baked and cooled, decorate the gingerbread men and reindeer with your favourite icing recipe. We place two of the 12 inch circles on a lazy Susan as a base so the entire carousel will spin when done. Cover the bottom tier with icing to look like snow, and gumdrops, or Nerds, or M&Ms etc.. We use an iced stack of cookie wafers for the centre post, but other recipes use an empty nut can because it is sturdier and reflective like a mirrored carousel centre. Position six candy cane sticks as posts around the edge of the base tier (same height as the centre that you choose) and cement them in place with a healthy dollop of icing. (Candy cane sticks are better than hooked ones). IMPORTANT: Let everything dry at this point! Once the base and candy cane posts are dry, you can add the reindeer to the posts with a dollop of icing. They will look like horses on a carousel. You can position the third 12 inch circle on top of the candy cane posts and the centre support to create the second tier. Adhere with icing. Build up another centre post with cookie wafers to form the peak and lean candy canes like a tee pee. Top off with a gum drop. Use Jujubes and icing to prop up the gingerbread men. Then decorate as you wish with sprinkles or powdered sugar.